Fair warning... the market is running hot right now, the question is, will it continue? Our February sales were at record levels while the volume of housing stock in SA was down 14.8% (over 2,100 homes) from the previous year, according to RPData. With this tightening of supply & increase in demand, off market selling is forging ahead, upping the ante for buyers who are not tapping into online or registered to be notified of properties first (www.register.toop.com.au). Toop&Toop are reaching more buyers in ways never before possible. Last weekend’s launch of the Property Advice Centre (www.adelaidenow.com.au/advicecentre) created another paradigm shift in real estate. This online meeting place for property people in South Australia is a one stop shop for local real estate. As the power of online selling takes control, our Property Advice Centre breaks new ground in quality of information. In a ‘no holes barred’ series of interviews www.toop.tv examines property issues with those who know. “...the key thing is we’ve got China which is fuelling our growth, high population growth Ð fastest population growth in the order of 40 years, & we’ve got super strong demand for construction, whether it’s residential, commercial, engineering construction. So those 3 drivers really are powering the Australian economy & it is going to perform very, very well over 2010”. 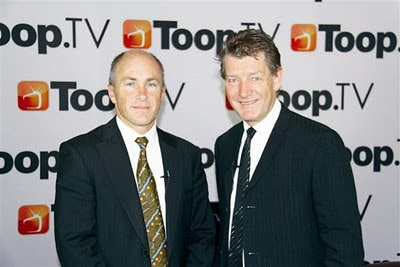 We also had co-host Peter Vaughan, CEO of Business SA, talk with us about all things local to our great state - so if you didn’t see it live just log on now to www.toop.tv as it is there to see any time that suits you. People have now worked out why a real estate agency has its own ‘TV station’... our customers get to access more buyers & tenants through it. With this week’s massive launch of The Advertiser’s own ‘TV Station’ now is an exciting time as world leading applications of new technology are being generated out of South Australia. Toop&Toop has become a trusted information centre for property. The Advice Centre includes services to help buyers, sellers, landlords & tenants come together. By creating an online space where all parties can congregate, in a confidential & discreet way, people with the same needs & interests can help each other. The general public are able to access inside industry information about all things real estate while South Australia’s best homes are showcased in a local way but on an international platform. Craig James, Peter Vaughan, Isobel Redmond, Kevin Foley, Katrina Webb, Roger Rasheed, SAFM’s Cosi, Mix 102’s Snowy, Tim Lawless (head researcher RP Data), & many more... all talking Adelaide property - www.toop.tv.